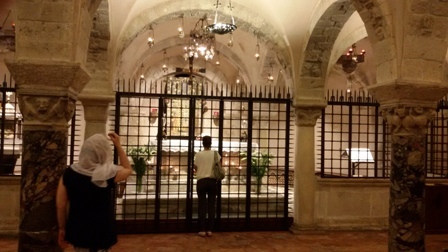 Last Thursday I finally had an opportunity to go on pilgrimage to Bari, Italy, to visit the Basilica of San Nicola and pray at the altar where his bones have been kept since 1087 after sailors brought them to Bari from Myra, rescuing them from Muslim forces advancing steadily across Asia Minor, where they’d rested for 750 years (he died there on December 6th, 343). 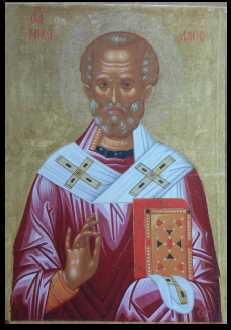 This is why he’s known as St. Nicholas of Myra and St. Nicholas of Bari. Bari is about five hours by train or car from Rome, so I was hesitant to make a special trip, hoping some opportunity would present itself. A father in my community commented after the fact that he’d just been to Bari, and when I mentioned how I’d like to go, another father in my community (to whom I am very grateful, but who prefers to remain anonymous) offered to take me on a day trip. We left early from Rome and arrived in Bari at 10:30 in the morning. 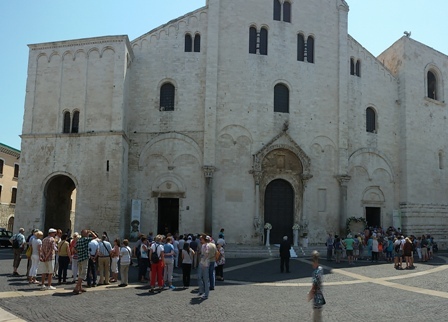 After a quick visit to the Cathedral, we headed to the Basilica of San Nicola. I was surprised to see that a wedding was being celebrated on a weekday in the main basilica. Since I wasn’t sure where the altar of St. Nicholas was, at first I thought I was blocked, but then I saw the stairs going down to the area beneath the main basilica. 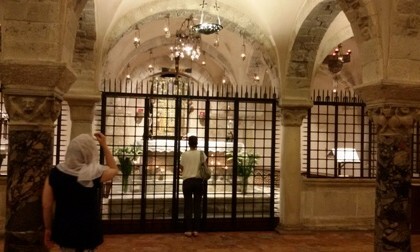 It was packed with pilgrims and the altar, in an area normally enclosed with black iron fencing (after all, at the same time sailors from Bari were deciding to “liberate” the bones of St. Nicholas from the Muslims, the Venetians were planning to do it too), was surrounded with clergy celebrating the divine liturgy. They were praying in a Cyrillic-based language, so I believe they were Byzantine-rite Ukrainian Catholics. 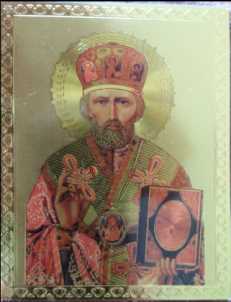 Slavs and Eastern-rite Christians have a great devotion to St. Nicholas (which is also why I was named after him, as well as my great uncle, a great grandfather, and other family members). I’d expected it to be quiet on a weekday, mostly empty, and a silent place to pray, but it was beautiful to see how much devotion there was to St. Nicholas. 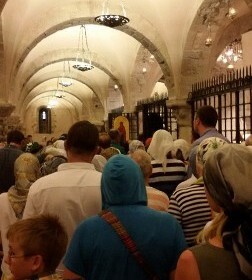 I didn’t feel my plans had been ruined; on a pilgrimage you take the gifts that God gives you. I was just moved to be in the presence for the first time of the relics of my patron saint, the man I was named after along with so many in my family. It was like visiting the tomb of a relative whom I’d never met before, an experience I had in 1977 when I visited the graveyard in Croatia for the first time where generations of my family were buried. I also knew that St. Nicholas had watched over me during my entire life, and by visiting his relics I was also thanking him for being my patron saint. I could tell you what family member I was named after, but in my family we can all point to St. Nicholas and answer that we’re named after him. We asked an usher how much longer the liturgy would last and he said an hour, so we decided to grab an early lunch and walk a little in the city and come back when things were quieter. An hour later we returned and there was another wedding up above and either the same liturgy going on below or a second one that had begun during our absence (now I understand why some people get lost attending a Mass in Latin). I decided my optimal prayer conditions were not going to happen, so I stood in back and started praying as the divine liturgy continued. It wasn’t too distracting because I didn’t understand a word they were saying, but it was also beautiful to hear clergy intone and the laity respond in chant. As I was praying the father who’d brought me told me the liturgy had concluded and now they were lining up to go up and kneel at the altar and pray and place religious objects near St. Nicholas’ relics. Normally the altar is closed off by the iron fence. Providential opportunity! Needless to say, I got in line and tried to act Byzantine (which really translated into not doing anything disrespectful and not trying to imitate the way they do the Sign of the Cross). I was in line for about an hour (the photos are about halfway through), and everyone was quiet and prayerful–they weren’t talking, and the only cell phones that were taken out were for photos or to say prayers (along with mine, since I prayed my breviary while waiting in line). At last my turn came. 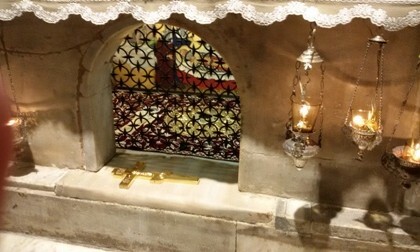 A small Eastern-style cross had been laid down at the base of the altar, and I kissed it and prayed for all the Nicholas’ and tried to pray for the one’s I knew by name, one by one (as of this writing I only forgot two of them–but I did get them a postcard). I had an image of St. Nicholas from Jerusalem and touched it to the grill work enclosing St. Nicholas’ relics, as well as a rosary ring already blessed by St. John Paul II. 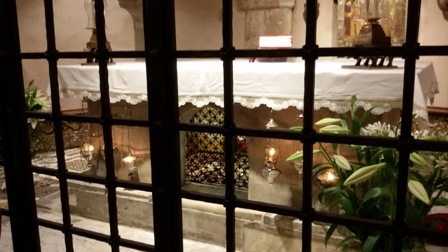 I was one of the last in line, and the pilgrims had left, so in the end I also got the quiet prayer time that I wanted, albeit with St. Nicholas’ altar now closed behind the fence. 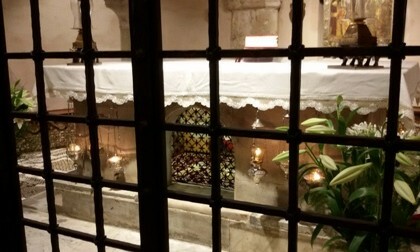 As I prayed others came up occasionally and reached through the fence to touch the base of the altar or leave something there briefly for a blessing, and I appreciated how fortunate I was. One young boy had to try sticking his arm through three times before he found the correct angle to reach the altar; I admired his perseverance. In the end I got all the quiet prayer time I wanted and more. The upper Basilica was now empty, so after a quick visit to the main sanctuary we returned to Rome and were back in time for dinner. If you have an opportunity to visit the relics or a church, shrine, or chapel dedicated to your patron saint. I encourage you to take a pilgrimage. You’ll be amazed how many spiritual gifts you receive, including an greater appreciation for everything that saint has done for you. On Wednesday the Gospel for the liturgy of the day summarized the purpose of sacred ministry beautifully: “whoever wishes to be great among you will be your servant; whoever wishes to be first among you will be the slave of all. For the Son of Man did not come to be served but to serve and to give his life as a ransom for many” (Mark 10:43-45). Ministry, whether sacred ministry performed by bishops, priests, and deacons, or ministries performed by other members of the faithful, are always ministries of service. Seminarians as part of their preparation for ordination are instituted in the ministries of Lector and Acolyte to assist in certain liturgical functions. In the case of the Legionaries they receive it one or two years before their diaconate ordination. As a professor this means my students to be within a year, and the students I have just taught are instituted each year in the ministries of Lector (my future students) and Acolyte (my past students). If that isn’t a blessing enough, living in Rome means I can usually attend their ordinations as well (as I did this year). Last Wednesday I concelebrated in the Mass where my past and future students were instituted in the ministries. This is the language Paul VI used: instituted in the ministries. The focus is not so much on being a minister as on the ministry, the service, that needs to be performed for the good of the faithful. As a sacred minister, a priest who doesn’t stop being a deacon, a servant, I can tell you that this is the key to being who Our Lord calls you to be: seeing and acting from the point of view of service. Let’s pray for these young men to continue to advance and grow in service.